Need a website? Tired of primitive systems that don't meet your requirements? Composr is Open Source so our community download runs without limits. Our services will give you that critical 'pro edge'. Hundreds of features are available out of the box, as well as building blocks, and further addons (think multi-channel content delivery). 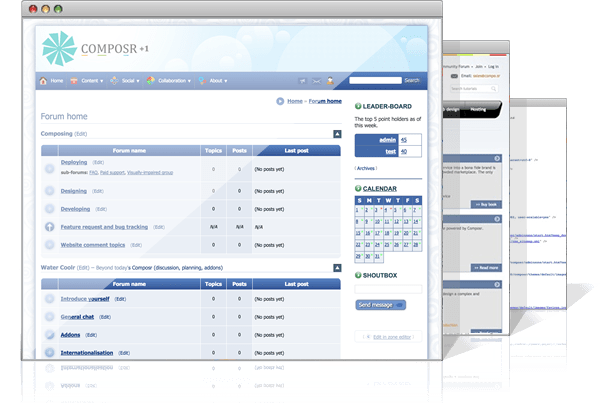 Composr is embraced by Fortune-100 companies, government agencies, and small startups. We make all the best ideas available to everyone. 10.0.25 released. Read the full article for more information, and upgrade information. Introducing two new frameworks inspired by Composr, but targeted towards the development of standalone web apps. 10.1 beta18 released. Read the full article for more information, and upgrade information. 10.0.24 released. Read the full article for more information, and upgrade information. An explanation for some recent instability on compo.sr. Get the latest news and updates with the Composr CMS e-mail newsletter. We'll keep you posted on the latest featured topics, research studies, videos, tools and upcoming web events.